Should Florida Strengthen Its Distracted Driving Laws? - Farrow & Pulice, P.A. 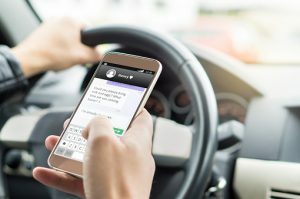 Home » Blog » Should Florida Strengthen Its Distracted Driving Laws? Should Florida Strengthen Its Distracted Driving Laws? Distracted driving is nothing new in Florida, but the explosive popularity of smartphones as well as high-tech in-dash gadgets in cars have made the roads more dangerous than ever before. Florida enacted a statewide ban on texting while driving in October 2013, but some safety advocates say the law does not go far enough. A police officer who sees you texting while driving cannot pull you over unless he suspects you committed another offense such as speeding or running a red light. Sarasota personal injury lawyers know that too many people in Florida continue to text and drive, which studies reveal can significantly increase the chance of a car accident. Text messaging boosts the likelihood of a car wreck by 23 times. Someone driving along I-75 in Florida who reads a text message takes his eyes off the road for an average of five seconds, which is like driving the length of a football field blind-folded. With public safety in mind, lawmakers in Florida currently are considering beefing up the texting while driving. One proposal calls for making distracted driving a primary offense, rather than a secondary offense. This means if a police officer sees you texting and driving, he can pull you over and give you a ticket, even if you were obeying all other traffic rules. Senate Bill 192 calls for authorizing "law enforcement officers to issue citations as a primary offense to persons who are texting while driving." House Bill 1 and Senate Bill 246 call for "enhanced penalties for such violations when committed in school zone or school crossing." The proposal also "removes requirement that specified provisions be enforced as secondary action by law enforcement agency." The co-prime sponsor is Rep. Ray Pilon, R-Sarasota, who was a co-sponsor of the texting while driving bill that became law in 2013. According to the Ocala Star-Banner, Pilon, a retired Sarasota County sheriff's deputy, said: "I compare it to how we introduced (the) seat belt law. When you do it as a secondary offense, you're not slapping people hard. You're starting with a very intense education campaign, which I think we continue to do. I think as more states get involved in the distracted driving issue, it allowed us the time to hopefully start changing people's behavior." Pilon told the newspaper it's time to take the next step forward by making texting while driving a primary offense. We believe education combined with law enforcement can ultimately save lives. As experienced car accident attorneys, we have seen first-hand the devastating results of negligent driving behavior. A car wreck can result in a serious injury that may require months or years of rehabilitation. In some cases, victims lose their lives, leaving family members not only heartbroken, but worried about how to make ends meet. Someone who chooses to read or send a text message is taking a risk not only with his or her own life, but with the lives of everyone else sharing the road. While tougher laws may lead to fewer injuries and deaths, we know that accident prevention ultimately is the responsibility of the individual driver. Regardless of the law, drivers should make the right choice: Don't text and drive. If you or a loved one is injured in a car accident, visit www.farrowpulicelaw.com or contact Farrow & Pulice, Attorneys at Law, at 866-408-1220. Serving Sarasota, Bradenton, Englewood, Venice, Port Charlotte and Lakewood Ranch.